Upon reaching sexual maturity, several species of male salmonids possess a relative ventricular mass (rMV) that may be up to 90% larger than females. This can increase maximum cardiac stroke volume and power out- put, which may be beneﬁcial to increasing the oxygen transport capacity of male salmonids during the spawning period. 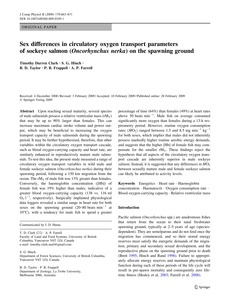 It may be further hypothesized, therefore, that other variables within the circulatory oxygen transport cascade, such as blood oxygen-carrying capacity and heart rate, are similarly enhanced in reproductively mature male salmo- nids. To test this idea, the present study measured a range of circulatory oxygen transport variables in wild male and female sockeye salmon (Oncorhynchus nerka) during their spawning period, following a 150 km migration from the ocean. The rMV of male ﬁsh was 13% greater than females. Conversely, the haemoglobin concentration ([Hb]) of female ﬁsh was 19% higher than males, indicative of a greater blood oxygen-carrying capacity (138 vs. 116 ml O2 l-1, respectively). Surgically implanted physiological data loggers revealed a similar range in heart rate for both sexes on the spawning ground (20–80 beats min-1 at 10°C), with a tendency for male ﬁsh to spend a greater percentage of time (64%) than females (49%) at heart rates above 50 beats min-1. Male ﬁsh on average consumed signiﬁcantly more oxygen than females during a 13-h res- pirometry period. However, routine oxygen consumption rates ð _ MO2 Þ ranged between 1.5 and 8.5 mg min -1 kg-1 for both sexes, which implies that males did not inherently possess markedly higher routine aerobic energy demands, and suggests that the higher [Hb] of female ﬁsh may com- pensate for the smaller rMV. These ﬁndings reject the hypothesis that all aspects of the circulatory oxygen trans- port cascade are inherently superior in male sockeye salmon. Instead, it is suggested that any differences in _ MO2 between sexually mature male and female sockeye salmon can likely be attributed to activity levels.